When one hears the name, Mexican Pizza. Usually it is the Taco Bell Mexican Pizza that comes to mind. At least that is what I usually envision. My daughter made a Taco Pizza for me using pizza dough. It is super easy and tasty. Recently, though, I found a recipe that inspired me to try to replicate the Mexican Pizza that is found at Taco Bell. Thank you, CJ at Morsels for Life, my Secret Recipe Club assignment, for the inspiration. When one lives in California, there is no end to opportunities to have Mexican food...really good Mexican food, but there are those times when just popping into a Taco Bell for a Mexican Pizza just happens. Using that thought, CJ's recipe, and with dinner in mind, I knew just what to do. 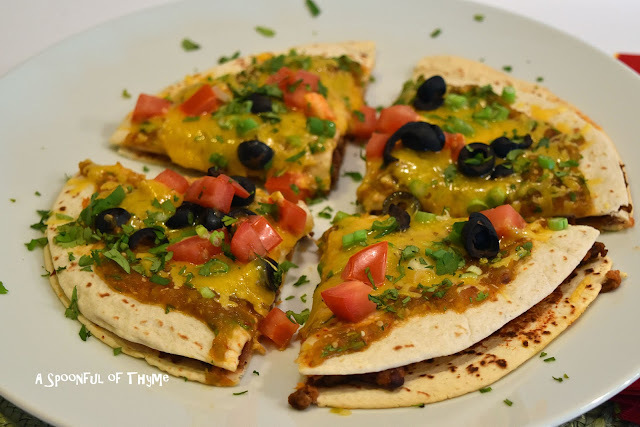 My vision was of a fun Mexican Pizza with a layer of refried beans and some spicy ground beef sandwiched between two flour tortillas and then topped with salsa, shredded cheese, green onions, black olives and tomatoes, and then sprinkled with chopped cilantro! I made some fresh Tomatillo-Chipotle Salsa but a jar of your favorite thick and chunky salsa will do. I just happened to have some tomatillos in the refrigerator that needed to become something! In a large skillet cook the ground beef and the taco seasoning. Break up the beef into small pieces as it is cooking. Drain. Line a baking sheet with foil. Place two tortillas on the baking sheet. Spread about 3 tablespoons of refried beans on each of the tortillas. Next, add a layer of the prepared beef and cover with a tortilla. Bake for about 10 minutes to heat the beans and beef. Remove from the oven. Allow to cool just slightly. Spread about 1/4-1/3 cup salsa over the top of each of the tortillas. Then top with about 3/4 cup shredded cheese, tomatoes, green onions and olives. Return the pizzas to the oven and bake an additional 7-8 minutes or until the cheese is melted. Slice each pizza into four pieces. Serve immediately. There will be enough beef left over to make additional pizzas or to use in nachos the next day. Be sure to use your favorite salsa as much of the flavor comes from that ingredient. If desired, you may also add a dollop of sour cream or guacamole before serving. This turned out just great! It is a quick and tasty meal. We love spicy so adding the salsa really perks it up! YUM....like a pizza quesadilla. Good SRC choice this month. They look delicious Kathy and something we would surely enjoy. 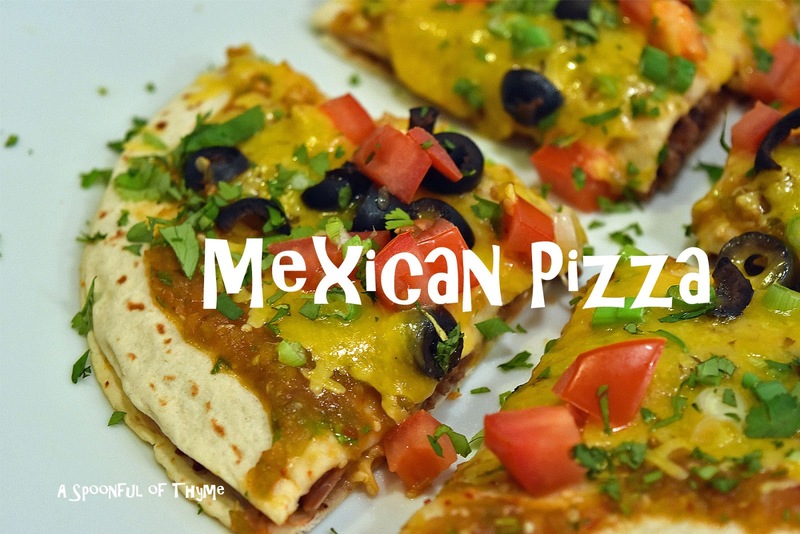 I love Mexican pizza. This looks so good!! Visiting from SRC B.
I can't believe I've never made something like this. It looks delicious!! Thanks for posting. Yum! It's kind of like a quesadilla but cooked in the oven. Love it! What a great appetizer this would make for a party, just pop in the oven when everyone gets there and wow! Taco Pizza!